Family, friends, and family friends: Where should they sit during your big moment? With parents, stepparents, divorced parents, grandparents, and extended family, all in attendence, you’ll need a plan. Here are our guidelines. You can enlist a few of your groomsmen to play ushers, or you can ask some relatives or friends to seat your guests. The rule of thumb is one usher for every 50 guests. If you’re having an intimate ceremony, you may not need ushers, but you might want to put someone in charge of “sensitive” seating issues — like keeping your mom and stepmom apart. *Elderly guests should be seated near the front. *Guests in wheelchairs or on crutches should sit at the end of a pew. godparents) and other special guests (like the parents of a child attendant) by tying ribbons across those rows. *Immediate family is seated just before the ceremony begins. Siblings (if they’re not in the wedding party) are seated before grandparents and great-grandparents. They sit either in the first row with parents or in the second row with grandparents. Start seating with the groom’s side. *If you have step-relatives, make sure ushers know who they are. Step-relatives should be escorted to their seats first — for example, step-grandparents precede birth grandparents. You may want to reserve a few extra rows directly behind immediate family for step-grandparents and stepsiblings. *If the bride’s or groom’s parents are divorced, seat the parent who primarily raised the bride or groom in the front row with his/her spouse, and seat the other parent and his/her spouse in the third row. Alternatively, birth parents may sit beside each other in the first row, or they may share the front row with stepparents. Discuss this in advance to avoid awkward moments. 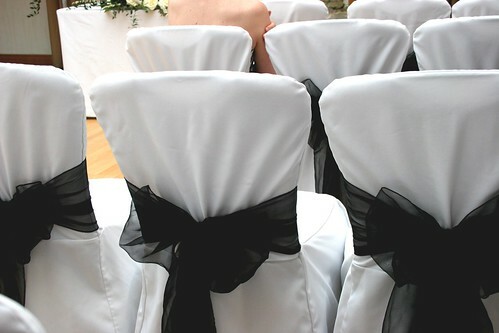 *The bride’s mother is always seated last at a Christian ceremony; the groom’s mother is seated just before her. (In Jewish ceremonies, parents stand under the huppah with the couple). The seating of the bride’s mother signals that the ceremony is about to begin. *Brothers of the bride and groom usually seat their mothers; the head usher can do it if the brothers are in the wedding party, or a brother can seat his mom and then take his place with the other groomsmen.